The Valparaiso Chamber brought home the honor of the statewide Indiana Chamber of the Year at the 2017 Annual Conference of the Indiana Chamber Executives Association. The award was presented by John Myrland, senior vice president, community engagement executive, Central Indiana Region Old National Bank, the official sponsorship partner of the 2017 awards for the Indiana Chamber Executives Association. Three finalists were reviewed by a panel of judges located outside of the state of Indiana to determine the 2017 recipient. Chambers are judged in the areas of leadership and organization; finance; advocacy; membership; and programming. The Valpo Chamber, through its economic development partner, secured a private equity investor to construct a $6.5 million shell industrial building to attract businesses looking for a new location. The building was completed in May 2017 and now the marketing effort has begun to find the end user. Another example of how the Valpo Chamber helped to enhance the level of business activity in the community was success in being selected as the development site for an Australian-based corporation to build the largest investment ever in the community’s history. The company opened in 2016 and now employs 500 individuals. This construction project provided numerous local firms with contracts and employment. The Valpo Chamber has adopted eight specific issues in the public policy arena over the past three years. One important success during this past year was the chamber’s active and visible role in bringing attention to the need for a $140 million school referendum. After endorsing the project, the chamber encouraged volunteers to lead the effort by becoming personally involved in the marketing campaign to the voter. Chamber board members took leadership positions on the marketing effort. Both referendums passed by an overwhelming 63 percent of the electorate vote. This effort was a game changer to ensure that for the next 30 years the Valparaiso school system will be adequately ready from a physical facility standpoint, as well as a staffing standpoint to continue performing as one of the top school systems in the state. 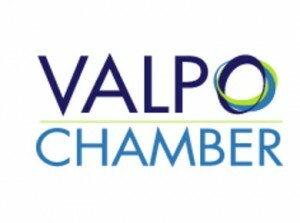 Recognizing the changing demands of the chamber member, the Valpo Chamber has completely revamped programming and marketing over this past year. The results have shown an increase in attendance through simplifying processes, discontinuing programs and enhancing offerings. During 2016, this chamber has also made a point of utilizing video to enhance member services and has received national recognition for this shift. The results have led to an open rate of more than 40 percent, with each video receiving over 1,000 organic views on social media. While many chambers are seeing a flat-line in member growth, the Valpo Chamber saw a record number of new memberships, welcoming 123 new members which generated $50,196 in new membership income during this past fiscal year. Some of the strategies used for membership recruitment include cold-call stops, utilizing biannual “leads contests” to engage existing members for referring new members, doing a monthly board “ask” for leads, and watching site review reports for new businesses. This chamber’s ended the year with a strong retention rate of 90 percent. ICEA has recognized a statewide Chamber of the Year since 2002. The Valpo Chamber had previously won the award in 2013 and 2005. There are currently no comments on Valpo Chamber recognized as 2017 Chamber of the Year. Perhaps you would like to add one of your own?